StickyJ Medical ID Jewelry is a provider of Oregon POLST Registry identification bracelets. 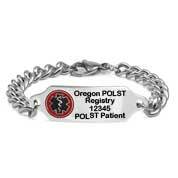 The metal bracelet displays the internationally recognized Staff of Aesculapius medical symbol on the front along with the words Oregon POLST Registry, your Oregon POLST registry id number, and the words POLST Patient. Oregon Emergency Medical Service (EMS) personnel are trained to recognize Registry IDs on Medical Jewelry and act in accordance with your POLST treatment selections. We will engrave the patient’s Name on the first line of the back of the bracelet. There is also room for emergency contact information on the back. If you'd prefer to order your bracelet by mail, simply click on OREGON POLST REGISTRY BRACELET ORDER FORM to download and print the form, and then mail it to us. Be sure to include your POLST registry number which can be found on the sticker you should have received from the registry. Send your completed order form with payment to: Customer Service, StickyJ Medical ID, 10801 Endeavour Way Unit B, Seminole FL 33777. If you have any questions, please call us at 727-823-9500.